I would honestly put one in every room if time, budget (and Mr. Pax 😉 ) allowed. So today is an especially happy one for me because it’s part two of our room-by-room Christmas tours, and we’re sharing our trees! If you’re visiting from Live Laugh Rowe again, welcome. 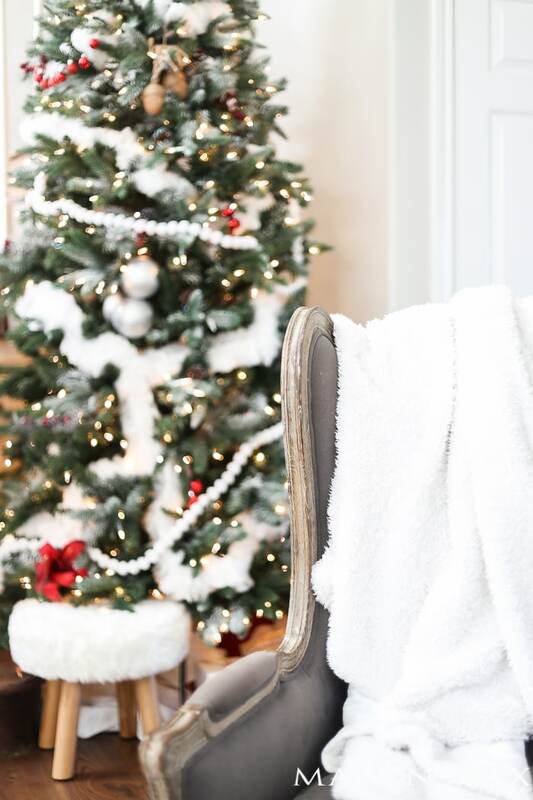 Cozy up and enjoy the trees today. And set to work. All four of us (myself and my three brothers) would help my mom – and break at least a couple of ornaments along the way. There were never themes or coordinating colors even, just boxes and bags full of memories: ornaments my mother had made as a child, pictures of us from grade school decorated in jewels and wreaths, a few very fancy ones that we tried especially hard not to break. There was the little wire gate we used to put up around the tree to keep the dachshunds from tearing up the gifts and gorgeous hand-embroidered tree skirt… I still chuckle thinking about those dogs. If you’ve ever owned a dachshund, you know that stubborn is an understatement. But I obviously digress… All that to say, I think it’s the memories you make around the tree that matters, rather than the decorations on it. For me now, dreaming up how I will decorate it is part of creating those memories. And letting the tree spark conversations with my kids about generosity and giving and the hope and anticipation of Jesus’ coming is even better. 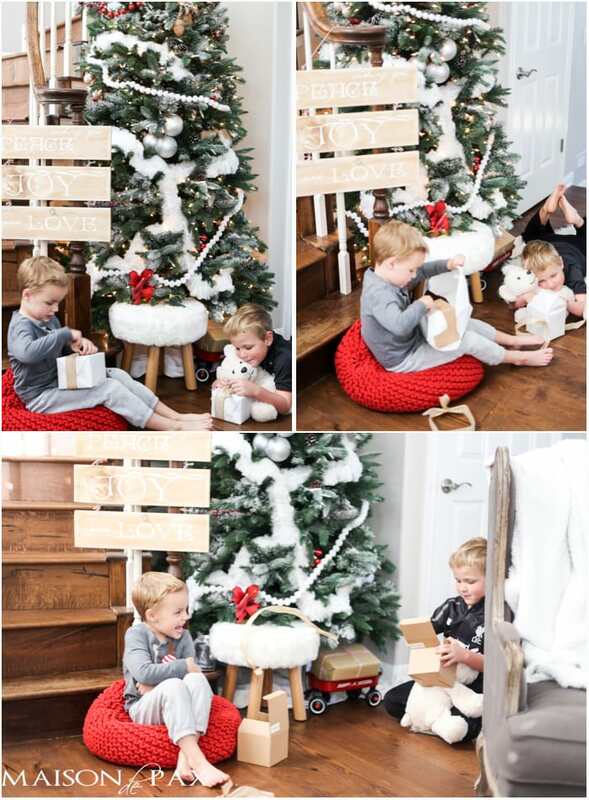 In fact, while I was photographing the tree, my boys insisted on choosing gifts for each other, wrapping them up, and sitting under the tree to exchange them. Oh. my. heart. 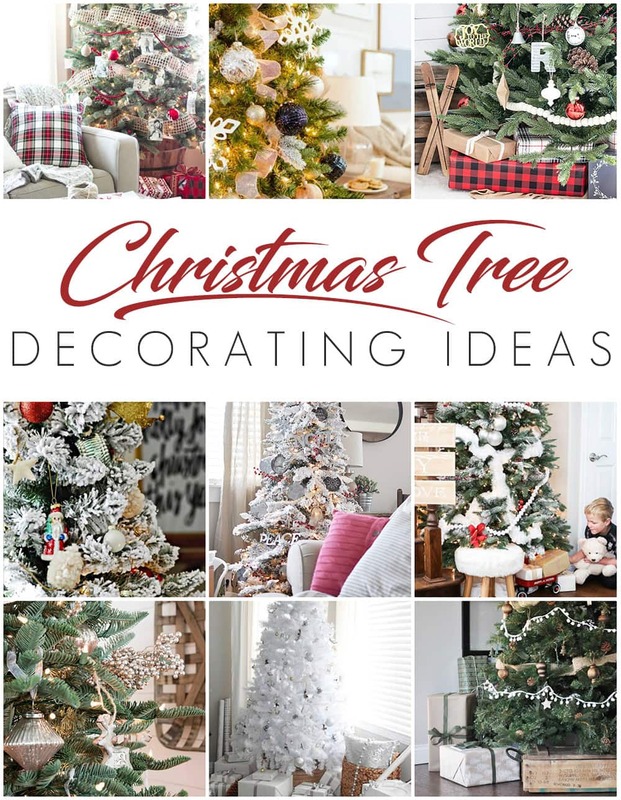 Do we need a tree to celebrate Christmas? Absolutely not. Am I incredibly thankful for the opportunity to use this fun and beautiful tool to help my heart prepare for the season? Most definitely. By the way, for my secret garland trick, you’ll have to visit my sweet friend Lucy who inspired me. 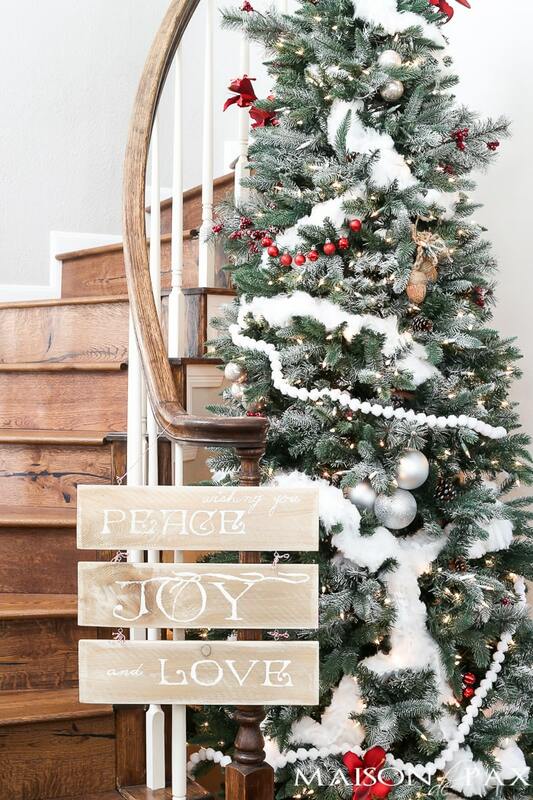 But you can get a full tutorial on the PEACE, JOY, and LOVE sign here, and step by step instructions for the angel wings hanging above my staircase here. 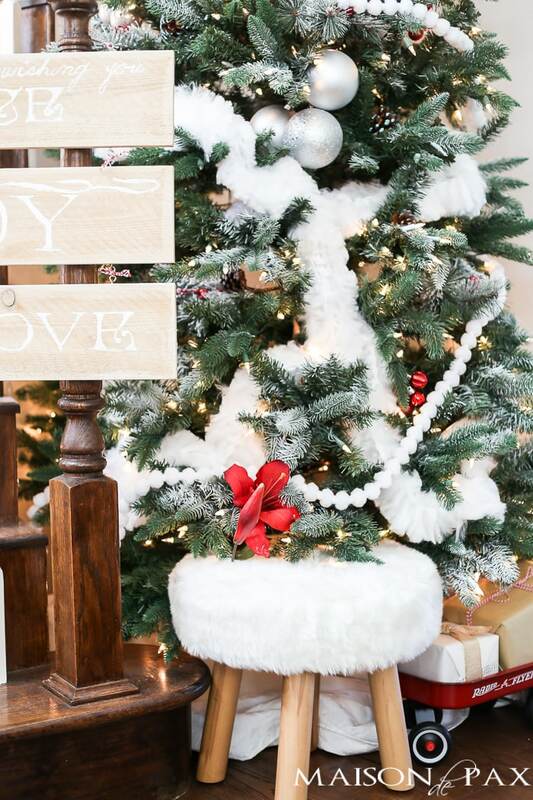 I’m also sharing my Christmas mantel today, so come see! 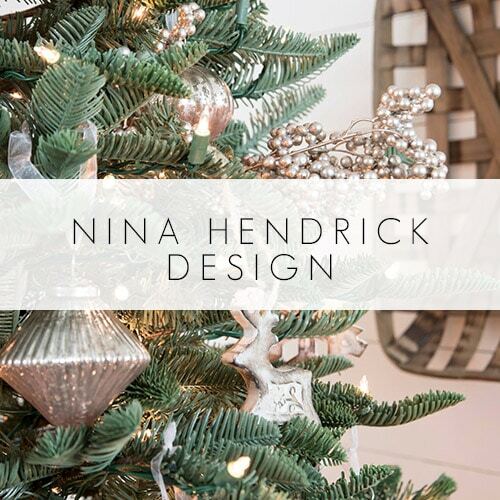 For more Christmas tree fun, be sure to visit Nina at Nina Hendrick Design. I know she won’t disappoint! And pin this to remember! 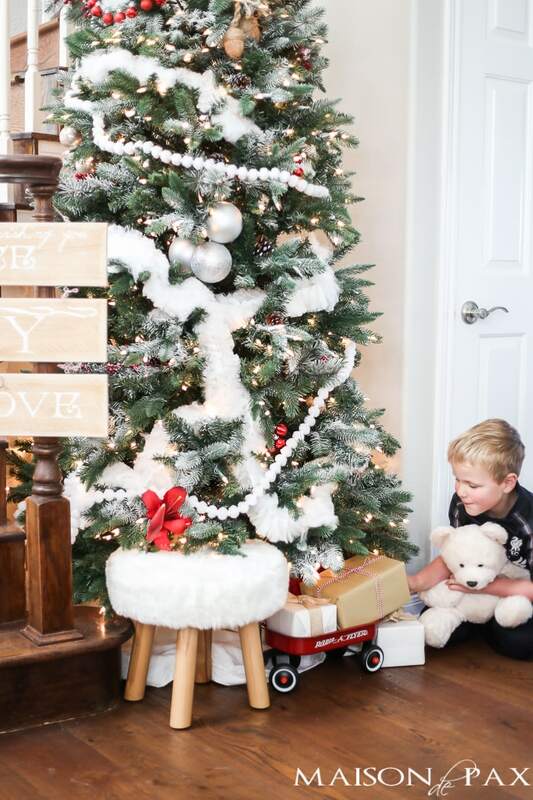 I must say that your Christmas tree spot is perfect! 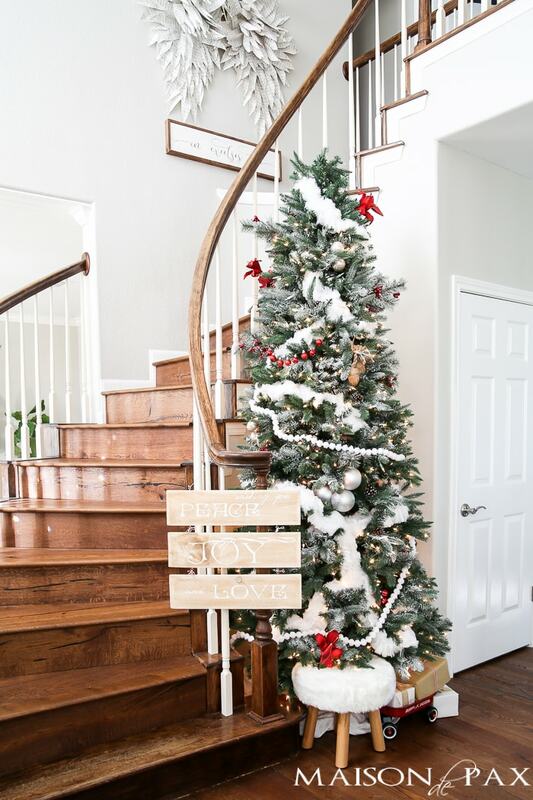 I love how it fits so nicely in the crook of that banister. Lovely! I love this! 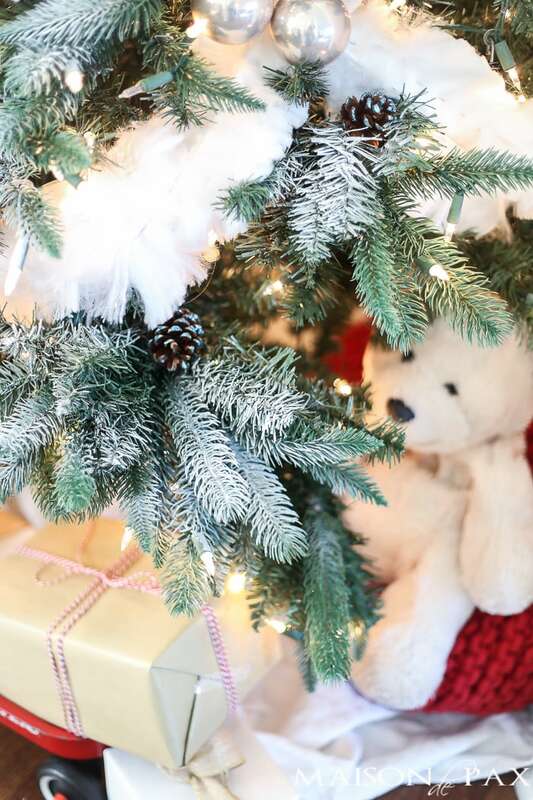 It made me think of my childhood and the special memories of putting up the tree each year! And your tree is beautiful! So pretty, Rachel! 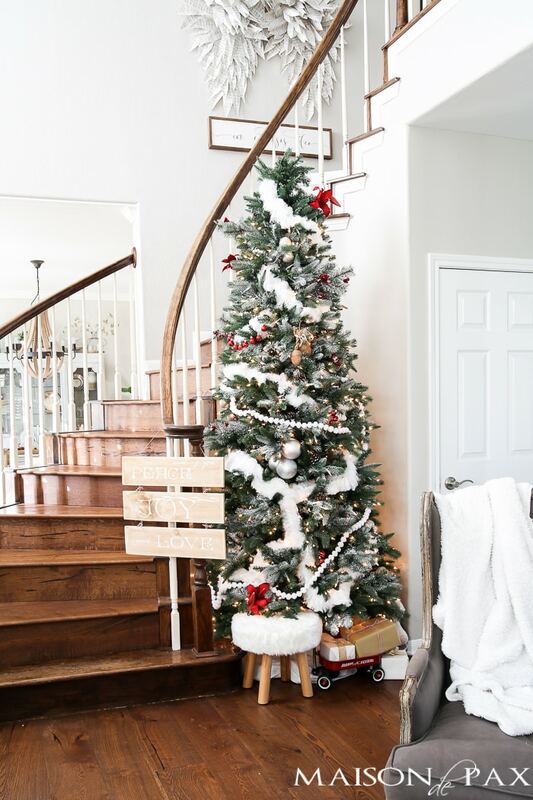 I am wanting to do a white and red this year as well – inspired by Lucy! 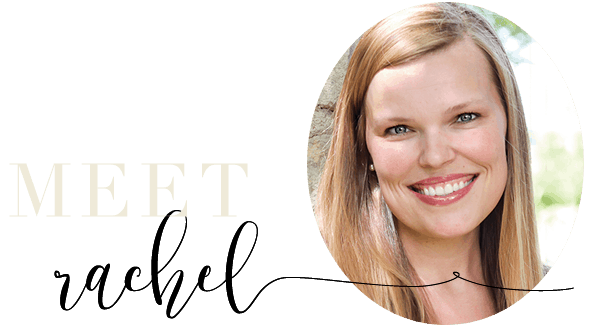 Lovely, Rachel, thank you for sharing! I was looking in the corner of your pics, wondering if you were going to say anything about the angel wings and sign… That is so cool! It really makes me think about the angels, singing glory to God, when our Savior was born! They must have been SO excited! I could just see them in Heaven, waiting for the birth, saying to each other, “He’s coming… He’s coooommmmiiiinnng!” Gives me chills!